Over a century ago, April 24th 1916, Ernest Shackleton and five of his expedition members set off on an epic 1,500 km voyage across the wild Southern Ocean in the small lifeboat James Caird. In a truly daring rescue effort, they sailed from Elephant Island in the South Shetland Islands to South Georgia. Their goal was to get help for the remaining members of the Imperial Trans-Antarctic Expedition still stranded on Elephant Island. The successful voyage is regarded as one of the greatest small-boat journeys ever undertaken. 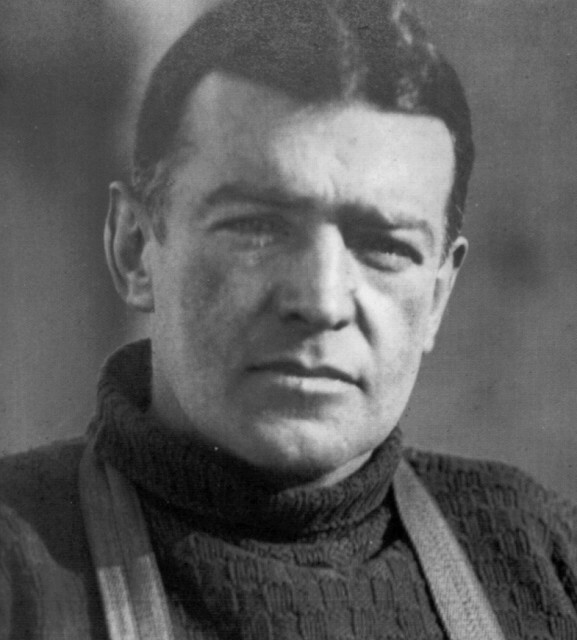 In August of 1914 the Endurance, led by Irish-born explorer Sir Ernest Shackleton, sailed out from Plymouth beginning the now legendary voyage to the Antarctic. The expedition that followed stayed true to the ship’s name becoming a gruelling feat of endurance and survival. 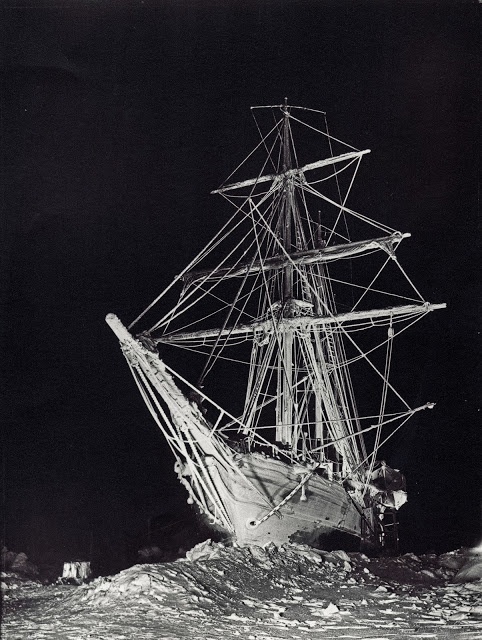 This was Shackleton’s third visit to the polar region. Having been pipped at the post in 1911 by rival explorer Norwegian Roald Amundsen to be the first to reach the South Pole, Shackleton now planned a new adventure to cross the Antarctic from sea to sea via the pole in what became known as the Imperial Trans-Antarctic Expedition. 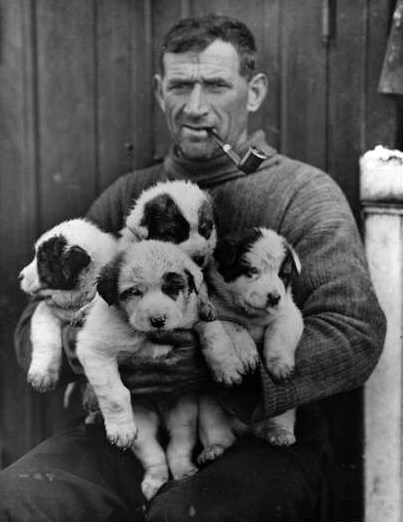 Shackleton’s team was filled with brave souls, perhaps most notably Kerryman Tom Crean who had served on Shackleton two previous Antarctic expeditions, the Discovery and the Terra Nova. Crean was an integral part of the team, known for his humour and bravery. On the earlier Terra Nova expedition, Crean had distinguished himself saving the life of a fellow crew member in an act of selfless bravery for which he was awarded the Albert Medal for Conspicuous Bravery. The journey began on the 8th of August 1914 when The Endurance set sail from Plymouth, England travelling towards the Grytviken whaling station on the island of South Georgia in the South Atlantic, roughly 2,000 kilometres (1,200 miles) due east of the bottom tip of Argentina. From here on the 5th of December, southern hemisphere mid-summer, the expedition properly began. They left the whaling station continuing south toward the Weddel Sea. The trip, smooth sailing to this point, was to quickly become a feat of true endurance. Only a few weeks into the voyage the Endurance entered thick Antarctic pack ice. The ship soon became stuck. 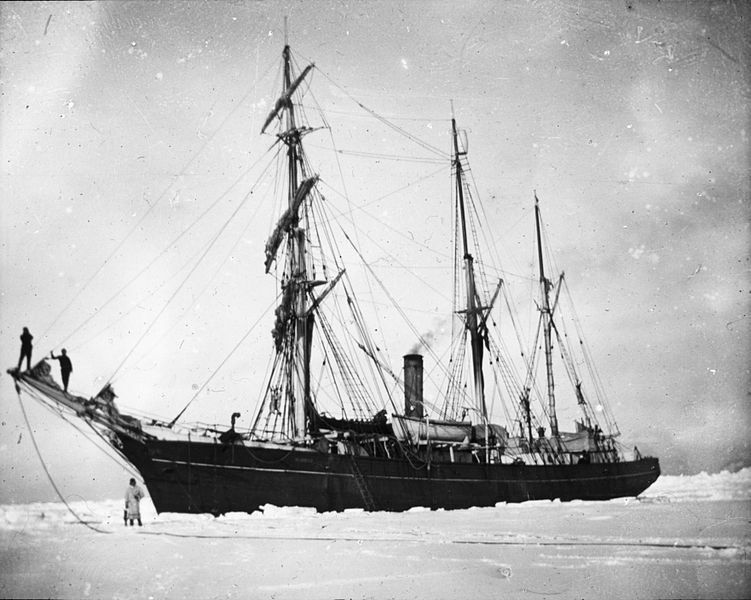 For nine months the Endurance was trapped in the ice, slowly drifting off course, eventually being crushed under the weight of the encroaching ice. 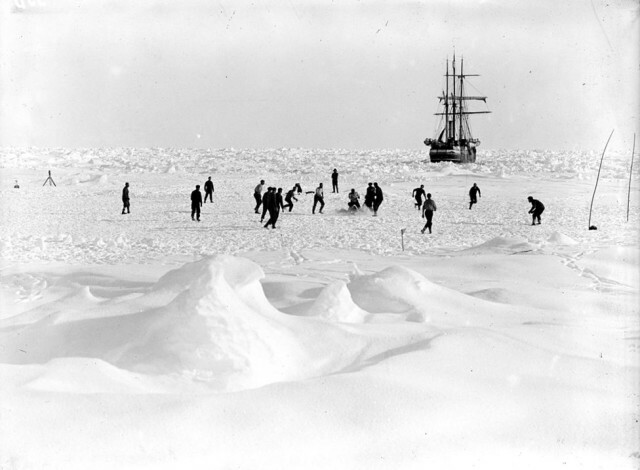 On the 17th October 1915, Shackleton gave the call and his crew abandoned ship. Weeks later, still camped by their ship, they watched helplessly as the Endurance sank before their eyes. They were stranded. The expedition had now turned into a race for survival. They travelled on foot north in the hopes of finding a place where passing ships would be most likely to see them. The journey was hampered by tough conditions and so they halted and set up what would be called ‘Camp Patience’. Then, when the ice floe has drifted further north, with three salvaged lifeboats, the entire crew set out on a gruelling 7-day voyage to the relative safety of Elephant Island. It was from here that Shackleton would make one last desperate effort to sail for help. 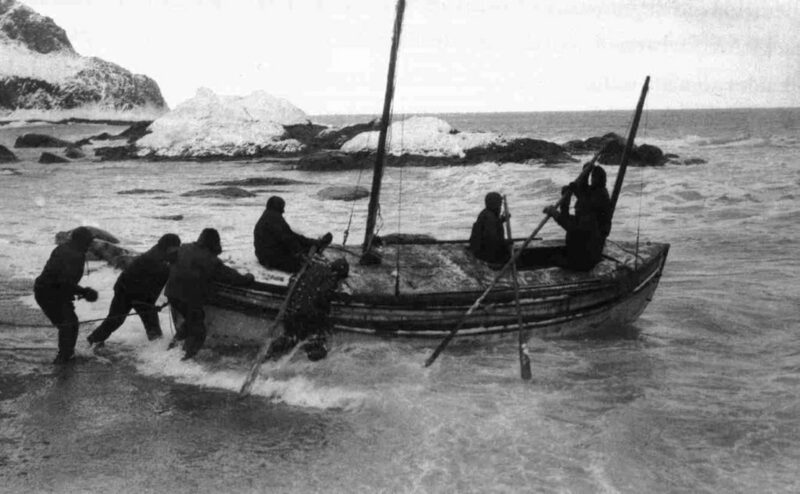 He chose five men and the most seaworthy of the three lifeboats, the James Caird, to go with him and find help. This was their last hope. On the 24th of April Shackleton along with Captain Frank Worsley, Tom Crean, Chippy McNeish, John Vincent and Tim McCarthy set sail. For over two weeks they found no comfort in the cramped quarters and freezing conditions as they fought against the seas and winds in a daily battle for survival. On the 10th of May, after 16 days at sea, they made it. But the struggle was not over yet. 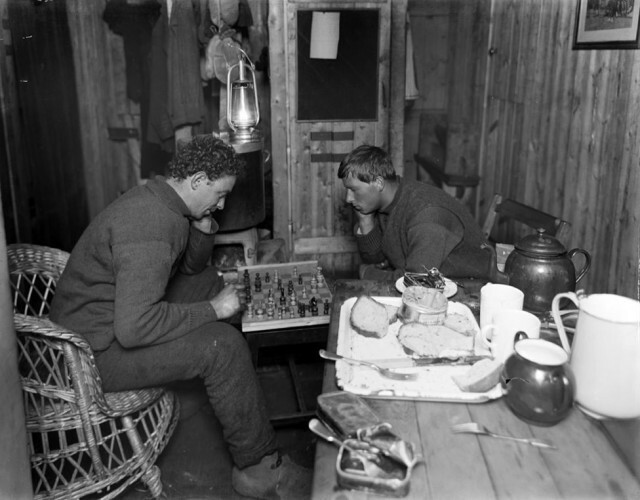 Shackleton, Crean and Worsley had to trek across the island to the Whaling Station, the other men were too sick to travel. They reached the station the next day and the three stranded men were rescued by boat. 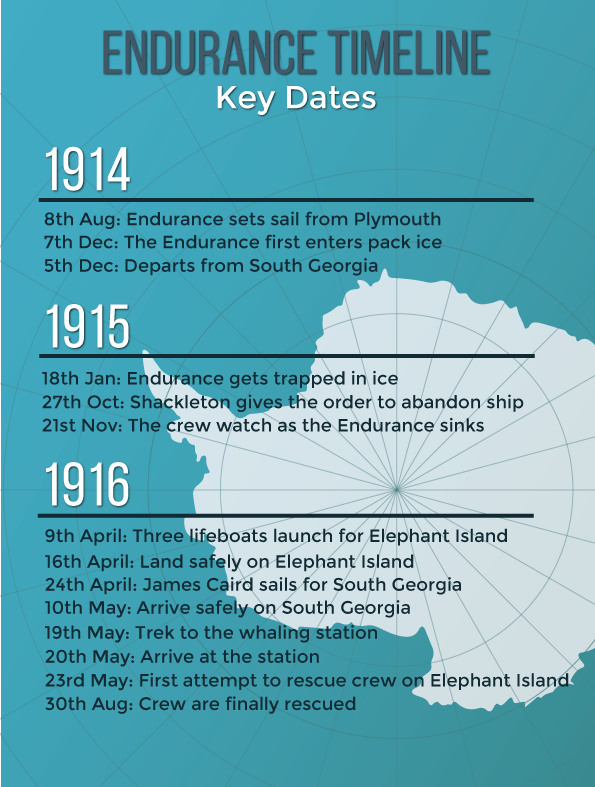 The remaining crew on Elephant Island were finally rescued 3 months later, 30th August, after several failed attempts to sail through the treacherous pack ice. How these men endured was a credit to Shackleton’s leadership skills and amazingly all 28 members of the crew survived this ultimate test of endurance. Their tale of adventure and survival is immortalised in the spectacular photos taken by Frank Hurley, the expedition photographer. 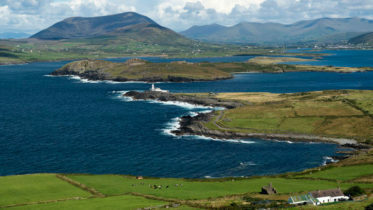 Hurleys photos taken on the voyage are truly breathtaking. They really give you a sense of how strikingly beautiful the white continent is as well as conveying how terrifying this desolate and barren landscape must have been for the crew stuck there. Shackleton was well aware of the demands of such a voyage with this being his third expedition south. His experience not only as an expedition leader but of as a motivator of people was crucial to their survival. Maintaining the spirits of the crew was vital and having games to play and downtime provided a release. The tale of the Endurance is one of true adventure. A quick look at the timeline of the events it seems unimaginable how these men could survive such trails and hardships through the long cold months, that became years, with no contact with the outside world. All photos belong to the Royal Geographical Society.